Getting a diagnosis of breast cancer can make you emotional. It’s normal to feel scared, depressed or angry. Often your doctor may not inquire about your inner state and your friends and family may not always know what to ask or what to say. Sometimes it helps to get a journal, join a support group or get a therapist. Find a safe place to consistently express yourself. At the same time, recognize that your thoughts about what is happening affect your feelings too. 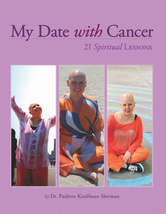 So try to find a powerful context for your cancer–like learning lessons, leaving a legacy, helping others etcetera. This will help you to vibrate love more than fear and this will indirectly make you feel better much of the time. If certain things helped you, please share. Part way through my chemotherapy treatment my son Noble had his 4th birthday party in Brooklyn at Bounce U. He was so excited to be jumping in plastic houses and sliding down big plastic slides with his friends. My husband and I got into the Spirit and joined them. After a long day of jumping, laughing and playing I felt much better. 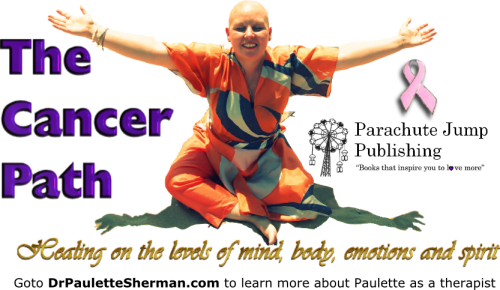 This led me to believe that hospitals should get together and sponsor a ‘Bounce U for Cancer Survivors Day.’ This could be a day to get away from all our responsibilities and the deadly seriousness of cancer so that we could just laugh and be in the moment. Rediscovering your playfulness is so important with this disease. We must remember to fill our day with joy and in my experience, no one can do this as naturally as kids. Chemotherapy is a drag in many ways. Putting poison into your body to kill the cancer cells is no fun. Neither is losing your hair or all the symptoms you experience. Being in the hospital for half the day is a downer too. Can I think of anything nice to say about chemo? Not really. What helped me was to imagine healing energy going into my veins as it went in and to distract myself with positive mp3s or meditations on my iphone. I liked to read or journal or talk to my husband to pass the time. I would definitely recommend bringing a chemo buddy to keep you company. I think most hospitals require that someone pick you up and take you home anyway because you may be dizzy. You can even bring funny movies to watch if you have an ipad or laptop. Remember that you can and will get through this. It’s like a marathon that will soon will be over. Then you can look back in amazement at how far you’ve come. I just wanted to write a quick blog post to say how important it is to celebrate your milestones on this path, because it’s a long one. I estimate this cancer experience will have taken up at least a year of my life when I’m done. And, just like in a marathon, we have to pace ourselves. So when you complete your segment of chemo or radiation, go out with a friend or two and celebrate. Buy yourself flowers, eat at your favorite restaurant or remind yourself how much you’ve completed of treatment and how much stronger and wiser you are for what lies ahead. Cancer reminds us to appreciate every day and it calls upon us to marshal our strength and self-love. Others also may also want to join and support you in different ways. So let us know what you do to celebrate. ‘Books that Inspire You to Love More. In life there are always setbacks, especially when it comes to cancer treatment:) First of all, no one can tell you how you will feel day to day or whether the cancer will return. Also, there are lots of unexpected things like a doctor being out, insurance problems that make you switch hospitals mid-stream, a port not working so you might not get chemotherapy after being in the hospital all day… These things feel annoying when you’re tired and emotional but unfortunately they are part of the bumpy cancer path, and probably life in general. -Advocate for yourself: if your dr. is out, ask to see another one if you won’t be back for 2 weeks. If your port doesn’t work and you’ve been medicated and in the hospital all day, request a nurse to stay a bit later to finish with you (if you are working all week and cant return). If your insurance suddenly isn’t covered, get an advocate, write a letter to the hospital and ask for a reasonable transition time to switch in the middle of your treatment. Some things will be out of your control but others are workable when people care a bit more and are asked to pay attention. -Distract Yourself With Better Things: Bring along tapes from authors you love, great music, food or games–anything to raise your vibration and keep your thoughts and mood positive. -Bring Support: Often hospitals require you to bring someone when you are doing chemotherapy anyway but having a spouse, parent or friend is great because you can process what’s happening with them and gain moral support. Here’s a video taken after a full day of chemo where my port wasn’t working again. This has happened twice so far! Hang in there, you’re not alone on this path and I’m sending you love! After my breast cancer diagnosis and lumpectomy I was told that I had to get 8 chemotherapy treatments and 6 weeks of daily radiation. The 8 chemotherapies consisted of different drugs. There were 4 rounds of A&C and 4 rounds of Taxol. I went to chemotherapy every other week from 10-5:30. My husband went with me. We’d order lunch from Dos Caminos in the Meat Packing District and eat in my hospital room. Sometimes there’d be problems with my port and things would take even longer. The nurses were very sweet and patient. Now I just finished my 8th round of chemo treatment. I have 3 weeks off (woo-hoo!) before I start 6 weeks of daily radiation. It feels like a milestone. It’s been 4 months of treatment and I’m half-way through with three months left! If you’re reading this, maybe you’re just starting your treatment or maybe you’re finishing soon too. Please know that you’re not alone. Many of us are walking this same path and we can provide mutual support, tips and encouragement. You will get through this, so don’t give up! I’m sending you love and blessings along your path. 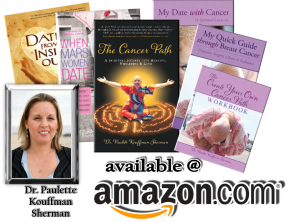 Coming in time, my book…’The Cancer Path: A Spiritual Journey into Health, Wholeness & Love.’ Sign-up for my newsletter to keep up to date on this book. Sometimes it takes an extreme wake-up call to make you get crystal clear about your life purpose. I was on the right track, but for me, my Zen stick was getting breast cancer. For others it’s a job loss, divorce or the death of a loved one. Am I doing what I love and using my gifts? What do I want to create while I’m here? What fears and excuses am I allowing to hold me back? How do I want to leave this world? Ask yourself these questions today and take one step in the direction of your dreams. For example, you may have been rejected by publishers, directors, galleries or record studios. Oprah Winfrey says that mistakes are just the universe’s way of moving us in another direction. So, don’t give up! Today it’s easy to self-publish, air your songs, poems and even films by yourself. Please share your creations with us. And check out my YouTube video channel about my cancer path.